Hyper bien situé dans le quartier de Trévise. Fontaine à 1 minute...... Bel appartement bien agencé. Personnel très sympa et cool. Merci pour tout. Everything was great just one problem with the wifi, we had no wifi the first night and then when it was fixed it was still slow, so we had to make two calls. On the last day/night it went out again. For me this was a huge frustration as I was on a working holiday. In future I would make sure to confirm proper wifi connection if I use this service. Great location. Very good service. The kitchen was not clean. Cooktop was greasy and plates and cutlery not clean. Shower Curtin has mould on the bottom. Having said that, we enjoyed our stay and would stay there again. It needs a few things attended to. We are an older couple and found the stairs up to the apartment an effort. It was fantastic to have our own apartment in such a good location, especially after a few weeks in hotel rooms. Was all much easier than I imagined and I can't wait to do it again. Thank you for such a great experience. Great location so we could access everything we want to do on foot. Everything needed was at the door step. Very busy and touristy spot but the apartment was light filled and airy so you could escape the crowds. We were pre-ordered taxi to the airport at 4 am, but did not receive a taxi on time. If you are traveling together with other people, please note that we manage five apartments in this building. These units can be rented together when available: Trevi charming apartment, Trevi house apartment, Trevi elegant apartment, and Trevi lovely terrace apartment. 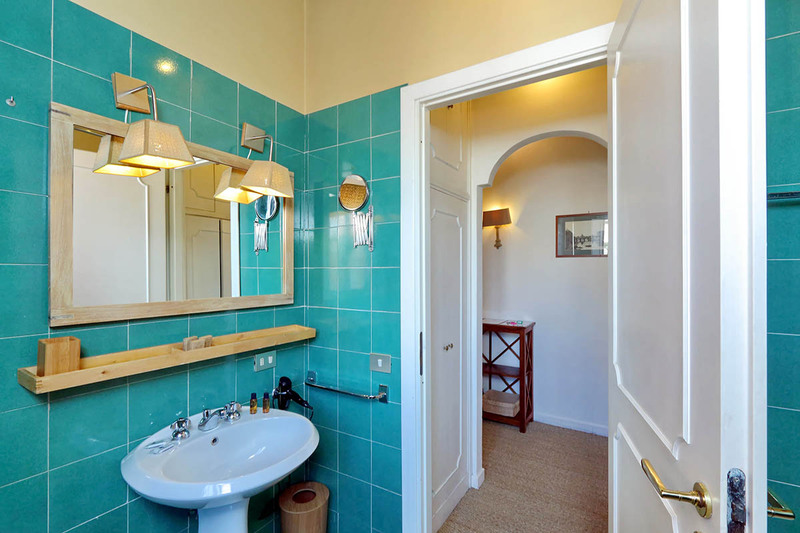 The apartment has also recently been tastefully renovated by an excellent interior designer. 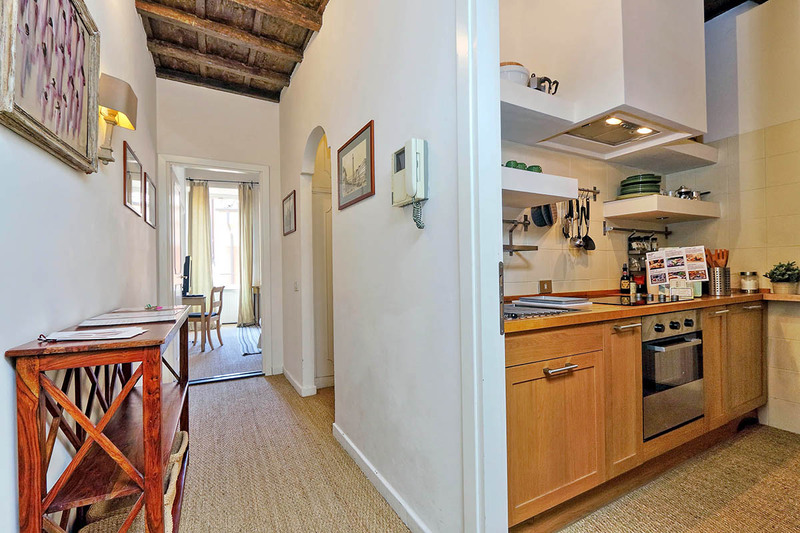 Upon entering this Rome vacation rental, you’ll find a well equipped kitchen with an electric stove, an oven, a toaster and fridge/freezer. Moreover, all the necessary cooking equipment is available for you to make a delicious home cooked meal. Why not try the local ingredients from the shops and outdoor markets nearby? The living area has a comfortable double sofa bed which can easily accommodate 2 adults. There is also a coffee table, a Hi-Fi system and a 32″ flat screen TV in the living room. For hot summer nights, guests will have access to an air conditioning unit in the living room. Shades of gray, white, beige and black blend together to create an elegant and intimate feel in your own home away from home in Rome. Furthermore, stylish artwork decorates the walls, complementing the pretty furniture. 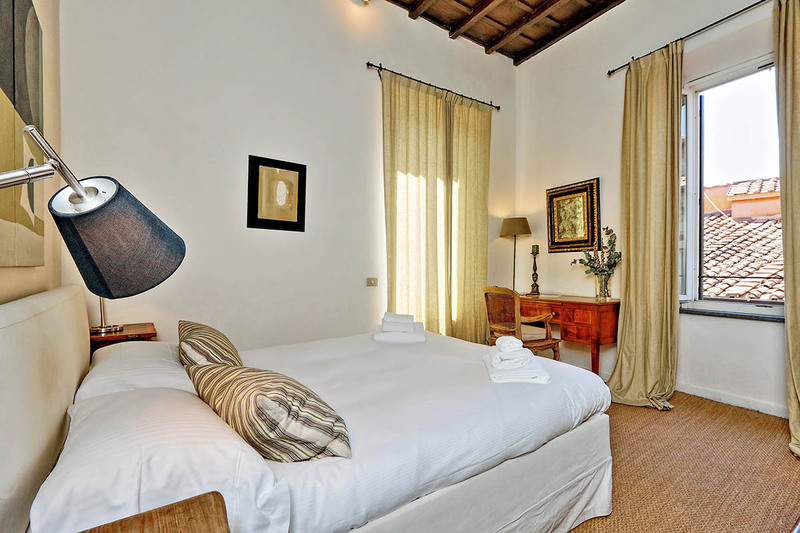 The master bedroom, which is very quiet at night, has a king size bed, night tables with lamps, and closets. The bathroom has a large bathtub with shower. 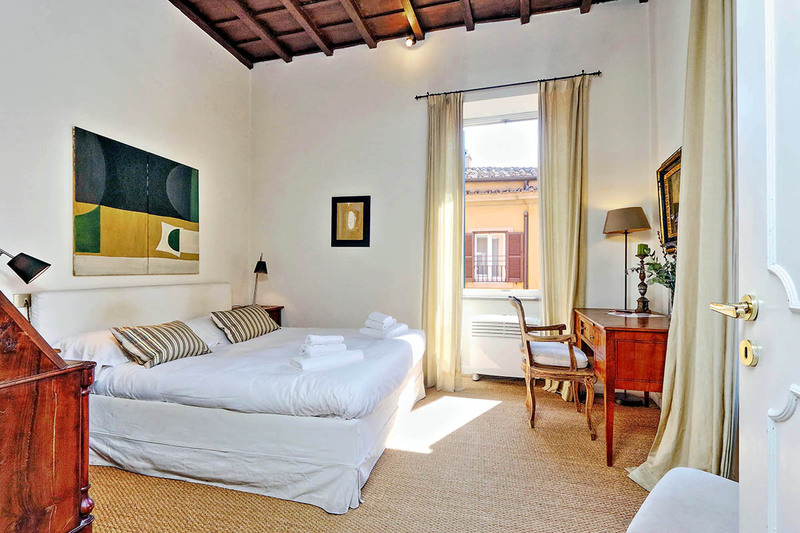 From every window, you will enjoy the sight of the surrounding Roman rooftops and lovely cupolas. As well as this, staying close to the Trevi Fountain allows you to experience its beauty late in the evenings, when the majority of the tourists have already left. We recommend this apartment to everybody, from couples, to young families, to mature travelers. 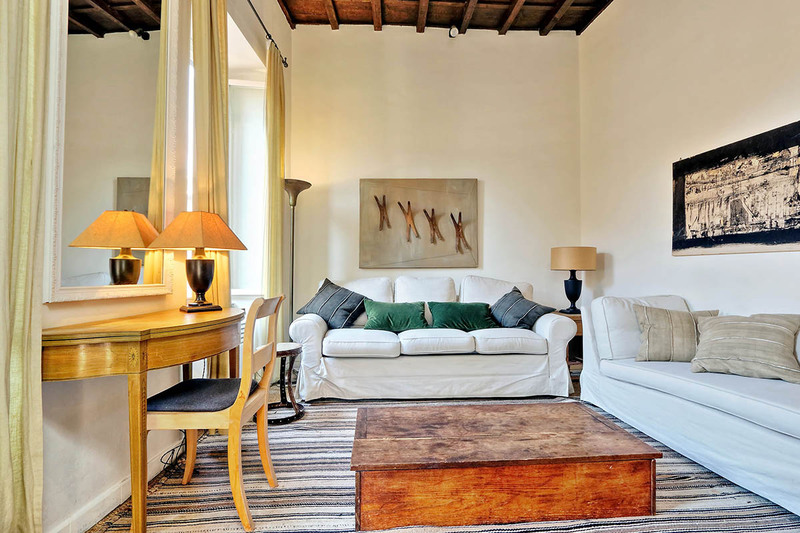 This apartment is just a stone’s throw away from the majestic Trevi Fountain and the beautiful Barcaccia fountain (at the foot of the Spanish Steps). 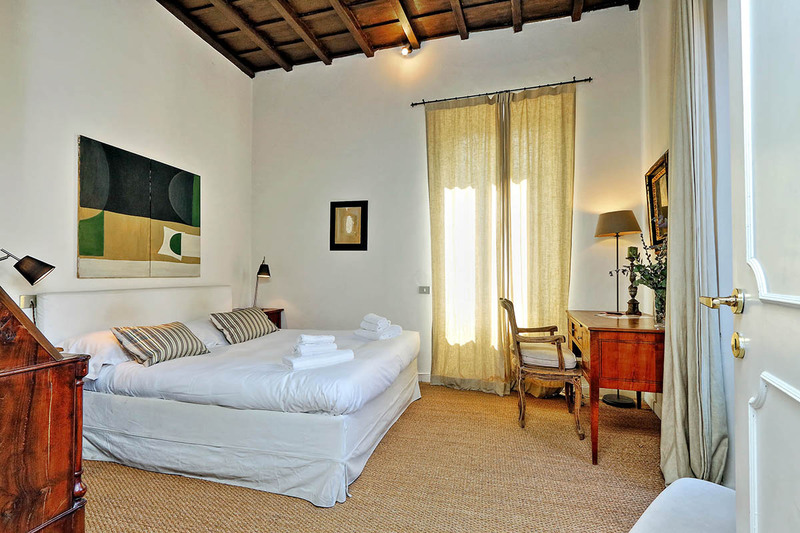 This moreover means that you are in one of Rome’s most elegant and stylish areas. On and around the Via del Corso, you will find a large range of high-street and designer boutiques. In addition to this, you will find some chic and refined restaurants and bars in this district. Here you can enjoy a drink close to home after a long day of sightseeing. The Spanish Steps also lie on the Metro A line, affording you direct access to the central station, Termini. From here you can also catch the Metro B down to the Colosseum and Giardino degli Aranci. A short walk will take you to the Pantheon and then the Piazza Navona area. Here you will find many more restaurants and bars that are more laid back. These are great for a relaxing aperitivo on your way home, or some typically Roman dishes. Malgré un problème de matelas la 1ère nuit, Romeloft est intervenu le lendemain après midi pour le changer et réparer le canapé qui en avait également besoin, et tout cela alors que nous étions un 1er Mai. Personnel compétent et geste commercial proposé directement en compensation des désagréments subis. Merci à Patricia et à sa res...Read Moreponsable pour leur suivi. Ménage et propreté passables. Nous avons passé un très bon séjour sinon et l’emplacement était parfait ! Very clean and comfortable apartment. More than enough room for the two of us. 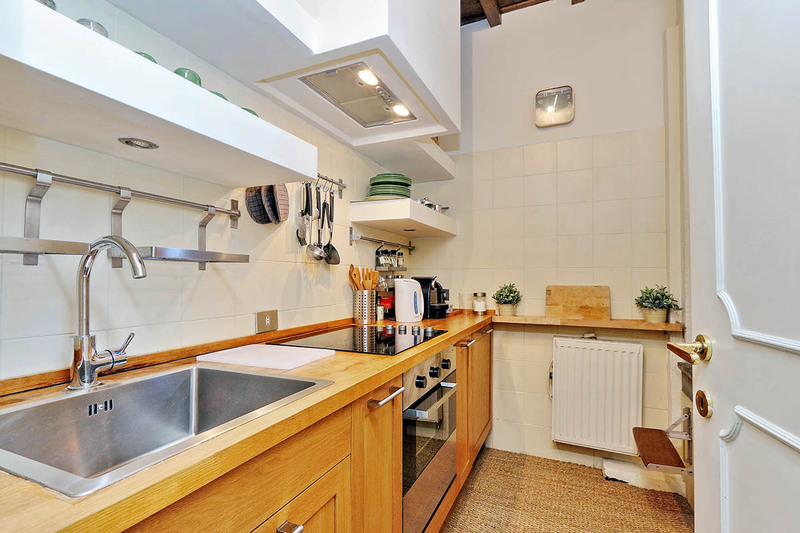 Large fully equipped kitchen. Shower had very good pressure. Only step from Trevi Fountain and more than eight gelato locations. The stairs were a minor issue due to a recent leg injury but we survived. We knew in advance that there is no lift/elevator so that was no s...Read Moreurprise. Would definitely stay here again. 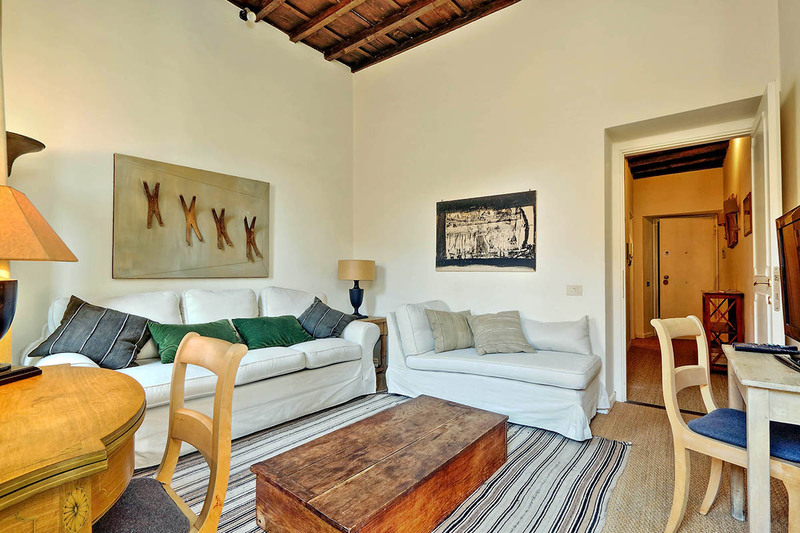 We absolutely loved Trevi Stylish Apartment! You can't beat the location - we walked to everything. You can't begin to imagine how close you are to the Trevi Fountain! The only attraction out of walking distance would be the the Vatican. Don't listen to the few negative comments others have written - I guess you just can't plea...Read Morese everyone! I can not fault the phone support staff or the person who met us with the keys. The Apartment is a little bit more 'rustic' in condition than the photos indicate - and the sofa bed wouldn't suit everyone but it was fine for our two children. Well equipped kitchen. Very clean and functional bathroom. I would stay here again without hesitation. 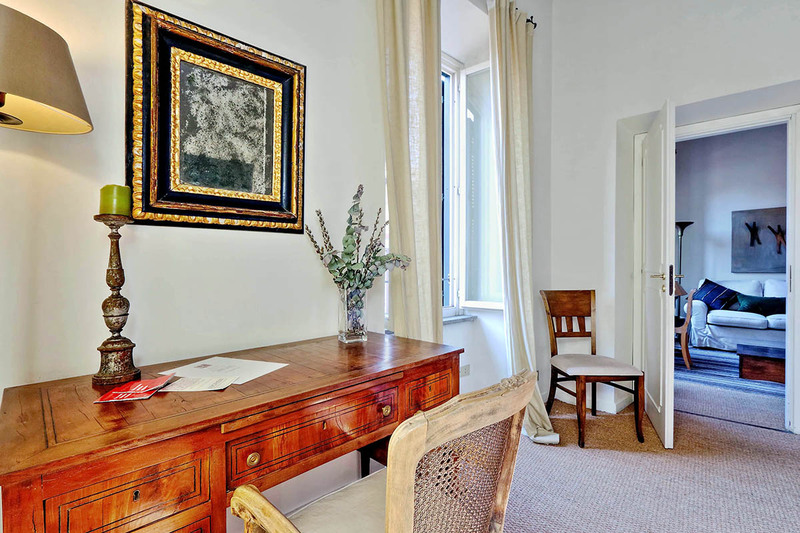 The apartment is at excellent location, adjacent to Trevi fountain and in walking distance to all major attractions in Rome. It's just perfect for a couple but for a family, the stairs can be bit tiring with luggage, also you need to add more utensils in kitchen for serving 3-4 people. The air-conditioning is very loud and can disturb sleep in...Read More drawing room. Nisar was very helpful and communicative as manager of property. Overall a wonderful experience. Would recommend to others. 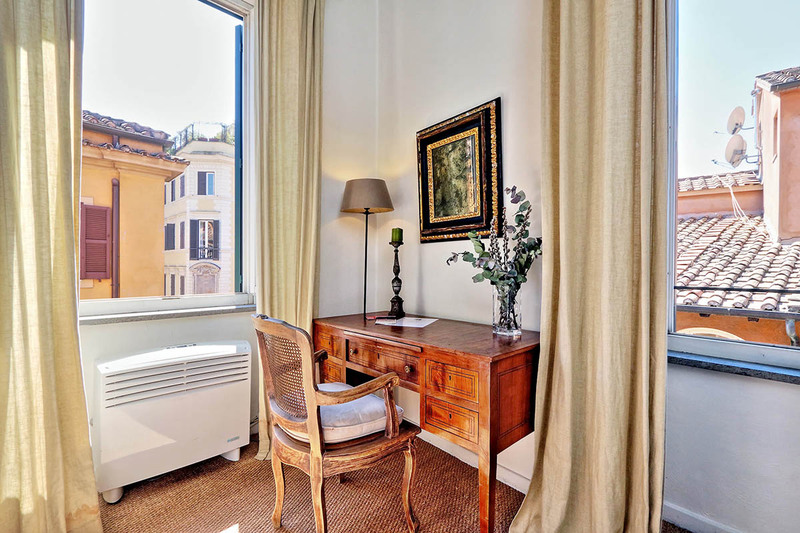 The Trevi apartment is in a perfect location, literally one minute (or less) walking distance to the Trevi fountain. The area we stayed in was safe, and full of shops and restaurants. We had a bad start to the trip, as British Airways had lost our baggage, however, Honey (our host) was extremely kind and tried to help us resolve the issue, where po...Read Moressible. If I return to Rome, I will definitely stay at this apartment again! Accommodation was very good with prompt arrival at the apartment on day of check-in. Difficulty in reaching Mr Honey by phone during our stay was a concern especially when the industrial action caused the 24 hour delay in our flight. The problems with WIFI availability/connectivity was annoying. Our sincere thanks however for making the necessar...Read Morey changes to our car transfer due to the 24 hour delay in us leaving Italy and we were very thankful that we could stay in the apartment for the additional night. Janis Palmer-Pascoe and Neil Pascoe. Oz and France. We stayed for four nights 4th February 'til 8th Feb. 2013 Met at airport, hired limo to apartment - no problems. Greeted at apartment by Gianni who took the heaviest bag (fortunately! )up the four! flights to our home for the next four days. Exactly as represented on the site - comfortable and elegantly furnished. Obviously Gianni had not b...Read Moreeen there that long before us, as the heating was just becoming effective, and it was also obvious that one of the more newly installed radiators was not working. Gianni said he would return to repair said radiator the next day (which he did). 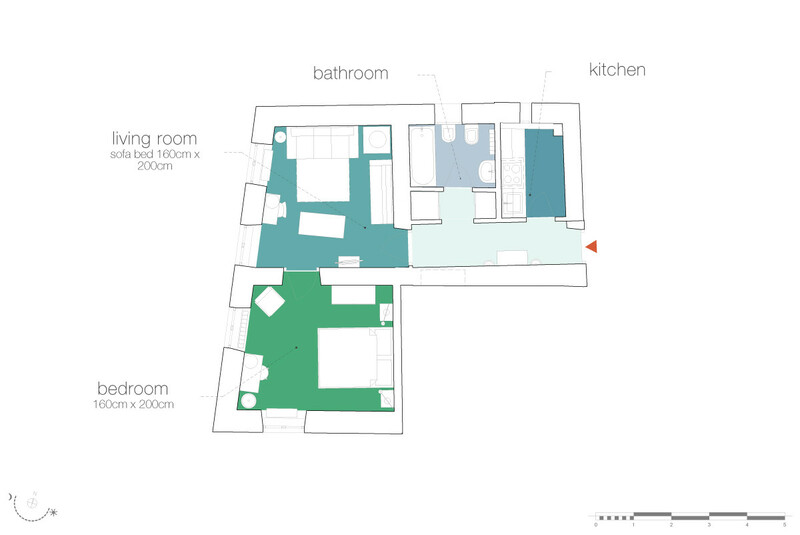 That said, the living room and bedroom were spacious and light. In winter the double glazed windows kept the warmth in and the noise out, surprisingly useful as Rome, even in winter, can be still quite noisy as revellers make their way home at night. The apartment was very close to everything, and as we had stayed last spring in a boutique hotel in the aventine area (very lush, green and quiet)it seemed a good contrast to experience. And it was. A few small criticisms though - kitchen was tiny, and the overloaded double adaptors would be unnecessary with a little more thought and update. The bathroom was the biggest disappointment though, and really not up to the standard expected - hand-held shower in bath, which did not fit into the overhead adaptor, so if you had long hair which required washing; so did the rest of the bathroom! Hairdryer's double adaptor did not fit socket, so had to use the overloaded double adaptor in the living room.....relatively small annoyances which would be very easily fixed. So why aren't they? To finish, overall a pleasant apartment in which to spend a week enjoying Canivale Roma, and if the irritating problems were addressed, we would happily recommend to all. I just returned a few days ago from a Europe trip abroad in Paris, Rome and Munich. 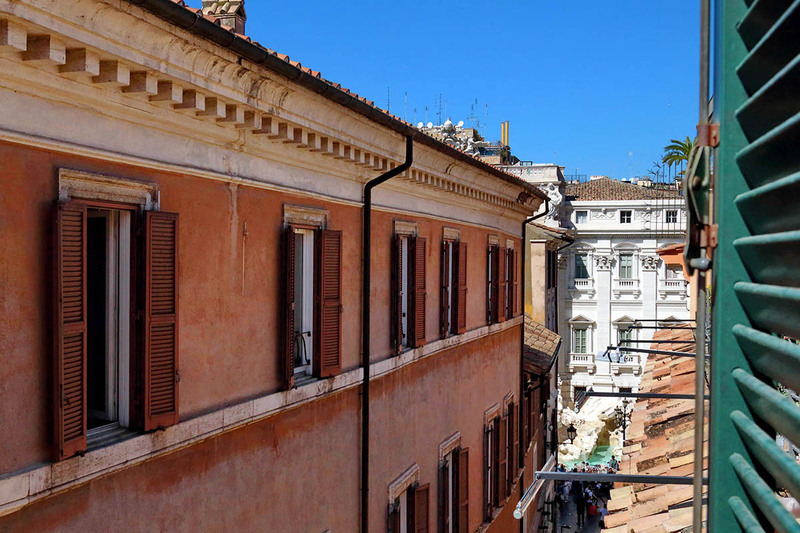 By far, my experience with Rome Loft and our Trevi apartment was the highlight of our trip! It was a fabulous apartment with a fabulous location. 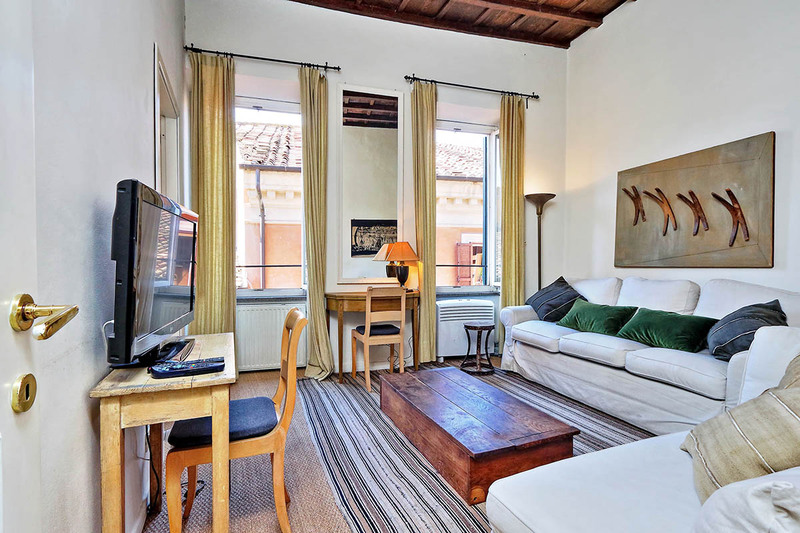 I often rent apartments when traveling and was extremely impressed with not only the professionalism of Rome Loft and...Read More their staff, but the apartment we rented exceeded our expectations. Sometimes companies represent the product as "more than they can deliver" not in Rome Loft's case--they excelled in ALL!!! We were half a block away from the famous Trevi Fountain and easy access and location to everything. Honey, the apartment rep, was so VERY HELPFUL on every front--especially when my son got sick and came quickly to assist and help. I would HIGHLY RECOMMEND this company and their staff and would love to come back again soon!!! A 5 star rating from this world traveler! 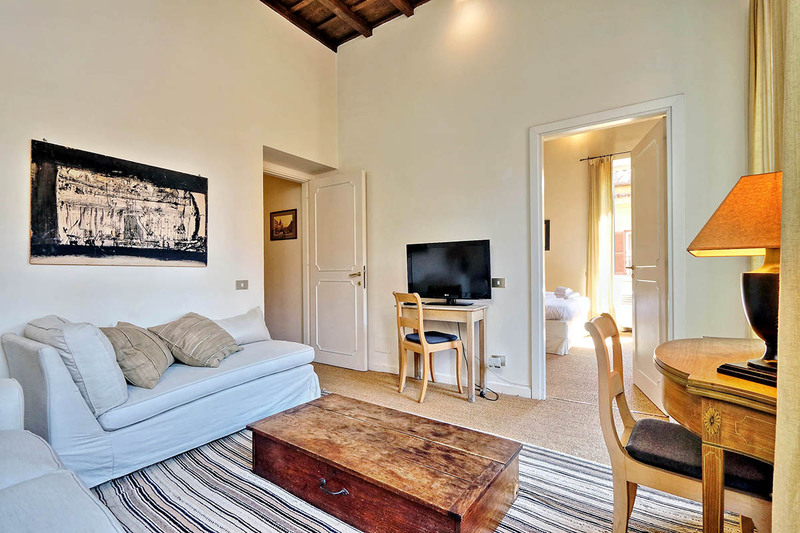 My boyfriend and I stayed at the Trevi Stylish Apartment from the 16th-19th of June. It was beautiful. The bedroom was spacious, the bed was comfortable, and the living area was huge. The kitchen and bathroom were also in terrific shape. The apartment felt cozy, romantic, and private. Very clean. Seeing the rooftops of the churches and other b...Read Moreuildings from our bedroom window was so incredible. We were in the middle of everything, so it was a really convenient location. Tons of restaurants and sites just steps from the apartment building. The walk up 4 floors was a little tiresome after a long day, but overall it was worth it. The street was a little noisy at night, but it was exciting nonetheless. Lots of energy in the air. After about 10PM the noise died down considerably. Also, the day we left, I forgot my iPad at the apartment. I called Mr. Honey in a panic and he actually came to the train station, where I was, to drop it off within the hour. I was incredibly grateful. The entire time, he always picked up his phone when we called, and he was always attentive and helpful. Overall, the service was lovely, the apartment was wonderful, and we can't wait to go back. Just the perfect apartment for us! 75 meters distance of the Trevi Fontana, so well located to see all the hotspots and go back to the apartment to relax a bit with a cup of tea before going for further sightseeing. The apartment has a tasteful interior design and is exactly as shown on the photos. 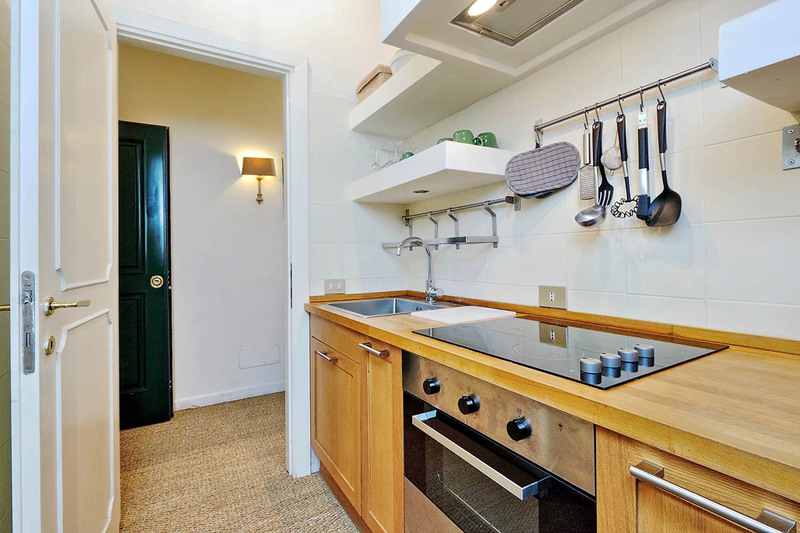 The kitchen is well equipped and there is a superm...Read Morearket just around the corner, ideal for breakfast. The only disadvantage is that it can be noisy (noise of people at the street) at night, but the rest of my family did not have any problems with that. We will surely recommend Romeloft to our friends and family.